Sometimes I wish I was one of those bold fashion peacocks, that I could mix my prints with style and confidence, but the fact of the matter is, I'm just not brave enough, on occasion I will and I love it, but for the most part I'm a bit "matchy matchy". I think a big factor is the town I live in too, I often find I'm more bold when I visit cities. When you live in a small town, it's hard to be "that" girl, the odd one who wears funny trousers and garish jewellery, oh dont get me wrong on the whole I am, but I do tend to tone it down most days. Tonight we went out for Sushi with gorgeous friends, including my best friend Sara who has been one of the biggest fashion influences in my life, she has set the benchmark so high, she always dresses with such style and flair, and I love her for that. 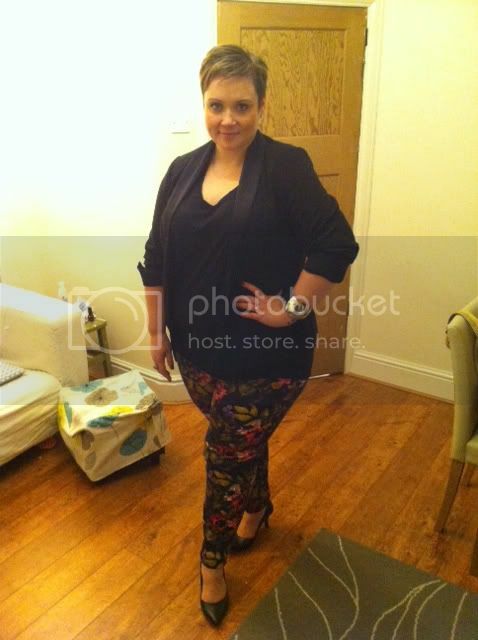 I wore my amazing floral trousers from So Fabulous, and in the small village in which the restaurant was I did get a few funny looks, but I had toned it down wearing all black with them. I wore a simple black Tee, my ancient black tuxedo jacket I've have for years and my trusty clarks court shoes, I've raved about these trousers in previous posts, but they really are so comfortable and the fit is great. I love the pansy print and the vibrant colours, so what if I get a few funny looks? 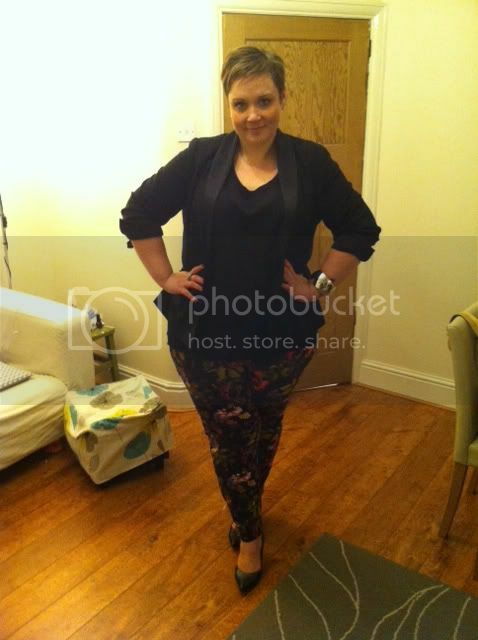 Forever loving my floral trousers! I wish I could mix and match patterns, I've tried, but people tend to tell me to change before they'll be seen with me. Hahaha. I am in love with those pants! I think you styled them beautifully. The pants are daring but the rest of the outfit is chic and subdued. It's perfect balance.